How can self-talk reduce stress and improve outcomes? A certain level of self-talk can be adaptive. In a stressful situation, it is not uncommon to use self-talk to regulate thoughts and emotions and encourage one’s self. However, not all self-talk is created equal. There is one strategy – psychological distancing – that can increase success if we incorporate it into our internal monologue. Recent research at the University of Michigan has found that a simple change in pronouns is enough to improve performance on a stressful task. The experiment required participants to give a speech and were given five minutes to prepare during which they were not allowed to take notes. During preparation, one group was told to use first-person pronouns during self-talk (such as “I feel anxious”), another was told to use second-person pronouns (“You feel anxious”), and still another group was instructed to use third-person pronouns (“[Participant’s name] feels anxious”). It turned out that people who used second- or third-person pronouns performed significantly better on the speech. Furthermore, they reported lower stress levels and had a more positive outlook on future challenges. The mechanism behind this distance is psychological distancing: when you refer mentally to the self as other, you lessen the effects of distressing feelings. Creating mental distance from threats is a strategy used in various methods of psychological therapy, one example being Accelerated Experiential Dynamic Psychotherapy. 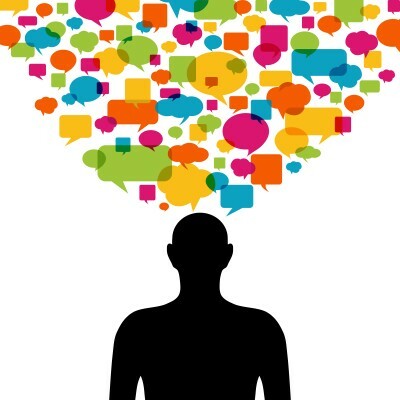 Changing the way we speak to ourselves takes practice, but can have helpful outcomes. If you’re seeking help dealing with stress or anxiety, feel free to contact the Manhattan or Bergen County, New Jersey offices of Arista Counseling and Psychotherapy at (201) 368-3700 or (212) 722-1920. For more information, visit www.acenterfortherapy.com . This is really interesting! Thanks for sharing this research. I often use self-talk as a coping technique, and this puts a new light on it. I’m glad I found your blog—lots of great psychology info here! It’s a great technique! Glad you like our blog; stick around for more!